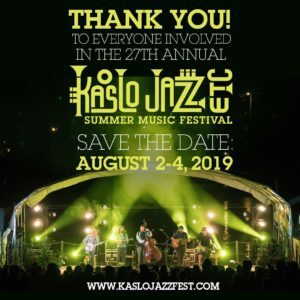 The 27th Annual Kaslo Jazz Etc. Summer Music Festival could not have been possible without everyone involved! From the incredible crew, staff, and volunteers, he hard working security, amazing performers, delicious vendors, generous sponsors and local businesses, beautiful community of Kaslo, and all the great patrons! We can’t thank you enough for being part of this vision. We are already very excited to share the magic with you all again next year: August 2nd-4th, 2019. Save the date and we’ll see you in Kaslo Bay! The Kaslo Jazz Etc. Festival is always looking to improve the festival experience and we appreciate constructive feedback. Please fill out this short SURVEY and your name will be entered into our contest for a FREE 2019 Weekend Pass!